"Scryed" redirects here. It is not to be confused with Scried. s-CRY-ed (Japanese: スクライド, Hepburn: Sukuraido), also known as s.CRY.ed or Scryed, is a 26 episode Japanese anime television series which first aired in Japan on TV Tokyo and Animax. The series is written by Yōsuke Kuroda, produced by Sunrise, and directed by Gorō Taniguchi, with music composed by Kōtarō Nakagawa. It is set in an alternative time in Kanagawa Prefecture where a phenomenon gave 1% of its people supernatural powers; they are known as Alters. The plot follows a young Alter mercenary known as Kazuma, as well as Ryuho, a man working for the Alter special forces known as HOLY, who become rivals as their areas clash. The series' concept originated in 1999 when Taniguchi was working on Infinite Ryvius. He wanted to create another series that would contain themes similar to it, as well as new ones centered mostly on how people adapted to the 21st century. A manga adaptation of s-CRY-ed, drawn by Yasunari Toda, was serialized in Akita Shoten's Weekly Shōnen Champion. A novelization by Kazuho Hyodo has been published. Additionally, a two-part recollection film was released by Sunrise. Both the anime and the manga have also seen English release. s-CRY-ed has been popular in Japan, often appearing on polls taken by Japanese magazines, and once took third place in the Anime Grand Prix awards. Critical reception to the series has been generally positive, with reviewers noting while initial episodes might be simple, the plot becomes more interesting as the series unfolds. However, reviewers were divided as to which language was more appealing - the original Japanese or the English dub. The series is set several years after "The Great Uprising", a future geological phenomenon in Kanagawa Prefecture near Tokyo. These people have developed a power known as Alter where they create weapons. The number of Alters rises steadily as the series progresses. There are two opposing forces of Alters: the Native Alters, a group of Alter users who live outside the central city and avoid any relationships with the government; and HOLY, a subgroup of Alter users in an organization called HOLD. HOLD functions as the Mainland government's super police force of the Lost Ground, while HOLY, composed exclusively of Alter users, serves as the special operations group, aiding it in performing dangerous missions that might require the help of an Alter user. Kazuma is a native Alter user who makes his living as a mercenary so that he and his close friend, Kanami Yuta, can live together. Kazuma's friend Kunihiko Kimishima gives him a mission to defeat another native Alter user. However, a man known as Ryuho from HOLY captures Kazuma in the aftermath. Ryuho tries to interrogate Kazuma over an unknown Alter user (later dubbed Crystal) who killed his mother and dog. Using a woman from HOLY named Mimori Kiryu as a hostage, Kazuma manages to return to his house. When native Alter users are captured by HOLY, Kazuma enters a forest where he finds Crystal. After fighting Crystal, Kazuma's Alter receives a power up. Shortly afterwards, it is revealed the Great Uprising was caused by a similar event in a parallel universe where all creatures are independent thinking Alters. Kazuma goes on a rampage against HOLY after Kinishima dies while helping him during one of his fights. Shortly afterwards, Kazuma and Ryuho fight, but during the battle, they open a gateway to the parallel universe, causing another uprising and attracting the attention of the Mainland government. Both Kazuma and Ryuho are thought to be dead after the fight. While Kazuma hides in underground fights, Ryuho suffers amnesia. With help from an old friend, HOLY member Straight Cougar, Kazuma recovers his will to protect Kanami who is searching for him. Ryuho also recovers his memories while fighting HOLY users attacking natives and ends up becoming one of Kazuma's allies. The Mainland sends its agent, Kyouji Mujo, to the Lost Ground in an attempt to exploit the power of the parallel universe for economic gain. Mujo develops delusions of grandeur after becoming the de facto head of the Lost Ground government and absorbing the crystal entity from "the other side" to add to his already formidable Alter power. Both he and the Crystal entity are defeated by the separate efforts of Kazuma and Ryuho respectively, as both increase their Alter powers by taking energy from the parallel world. The Mainland once again attempts to exert control over the Lost Ground by sending in a fleet of refined Alter users under their control. However, they are defeated by Kazuma and Ryuho. After defeating the Mainland forces, Kazuma and Ryuho engage in one final battle to settle their rivalry. As one of them is about to declare victory, the screen fades to white. In an epilogue, taking place years later, they remain the protectors of the Lost Ground, defending it from Mainland invaders, while an older Kanami awaits their return. According to the series' director Gorō Taniguchi, the idea for s-CRY-ed originated in 1999 when he was working on the series Infinite Ryvius. One of Infinite Ryvius's themes was people communicating with each other. The series' staff wanted to show people already on their own paths, focusing more on individualism. With the storyline beginning in the early 21st century, Taniguchi said the cast would already have adapted to the new times allowing s-CRY-ed to take more themes from Infinite Ryvius. The title s-CRY-ed is basically a combination of one English word and Japanese. The first lower-case "s" is a representation of the Japanese word su which means something in its natural form and not artificial. "Cry" comes from the English, and the last "ed" represents a person. Combined as "s-CRY-ed" the Sunrise studio staff wanted it to express the idea of how people react or interact when they are in their most natural state. They had devised the word when the project was in its early phases of production, and while it was meant to be a temporary name, the staff ended up using it as the title. When asked by the staff of the magazine Animerica if the anime was influenced by Western superheros like Spider-Man or Batman, Taniguchi denied that influence. Instead, he said his inspirations for s-CRY-ed were other works he had produced for Sunrise. The society shown in the series was not meant to be another take on classic superheroes but instead investigate how everyone can adapt to their own situation. While the series is known for the extensive action in its episodes, the director believes everything he wanted viewers to see was presented. To distinguish the HOLY members, the Sunrise staff researched the costumes they could design. Taniguchi said their outfits are meant to resemble prison uniforms. In Japan, the series was released between July 4 and December 26, 2001, with a total of twenty-six episodes. These were collected on nine DVD volumes between November 25, 2001, and July 25, 2002. A DVD box set containing all the episodes was released on January 25, 2008; a Blu-ray box set was made available on October 26, 2011. The Blu-ray box of the series sold a total of 6,172 units during its release week in Japan. The anime was licensed by Bandai Entertainment in early 2003. Starting in 2003, they released the show in North America as six individual Region 1 volumes, followed by a complete six-disc box set in November 2004. A Universal Media Disc version of the first volume was released on October 11, 2005. Bandai's European branch, Beez Entertainment, published the series in the United Kingdom. The release was a six-disc box set released between June 6, 2005 and February 27, 2006. Later, the series premiered on Adult Swim in the United States on May 28, 2005, after select episodes had been aired on Adult Swim's Video On Demand service for nearly a year. On September 27, 2005, Bandai re-released s-CRY-ed under the Anime Legends banner, in three two-disc volumes, followed by the Anime Legends Complete Collection on October 24, 2006. 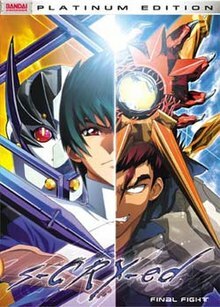 Following the 2012 closure of Bandai Entertainment, Sunrise announced at Otakon 2013, that Sentai Filmworks had rescued s-CRY-ed, along with a handful of other former BEI titles. In Australia, the series is licensed by Madman Entertainment. s-CRY-ed's music was composed by Kōtarō Nakagawa. Its original soundtrack was released on November 21, 2001, and two drama CDs were released on December 19 of the same year. For the first twenty-five episodes the opening and ending theme songs are "Reckless Fire" by Yasuaki Ide and "Drastic My Soul" by Mikio Sakai, respectively. However, for episode twenty-six, "Reckless Fire" is replaced by "Drastic My Soul", and the episode's ending theme is "Tabidachi no Kane ga Naru" ("The Bell of Setting out for a Journey Will Ring") by Sakai. There are also three insert songs starting with "All I Need Is Love" by Sakai for episodes fourteen and seventeen, "Magma" by Ide for episode nineteen, and "Discovery" by Sakai. Both the singles of "Reckless Fire" and "Drastic My Soul" were released on August 22, 2001. On April 8, 2011, Sunrise announced on the official s-CRY-ed Japanese website the series would be re-released and re-mastered in a two-movie release comprising the entire series and including new footage, titled s-CRY-ed Alteration, as part of the s-CRY-ed 10th Anniversary Project. During its release, TAO, the first part, took fifteenth place at the Japanese box office earning US$141,055 on nine screens for a per-screen average of US$15,673. In the following week the film dropped off the charts. The Blu-ray of the first part was released on February 24, 2012. It sold 6,624 units in its release week; it had sold 7,726 units by the end of the second week. The second part, QUAN, was released on March 10, 2011. Its Blu-ray volume was released on July 27 of the following year. The Blu-ray format of the second part sold a total of 6,543 units in Japan. The films also had a single CD including the new version of "Reckless Fire" alongside "SPIRITS" which was released on March 7, 2012. Additionally, another CD drama was released for the films on the same date as the single CD. A manga of the series written by Yōsuke Kuroda and illustrated by Yasunari Toda was published in the magazine Weekly Shōnen Champion between October 4, 2001 and June 20, 2002. The manga was collected in a total of five tankōbon (book) volumes. Tokyopop licensed this series in October 2002. They released the manga between March 11 and November 4, 2003. Additionally, a light novel series was written by Kazuho Hyodo and illustrated by Hisashi Hirai and published by Dengeki Bunko. The series was released between May 10, 2002 and May 10, 2003. Additionally, Kazuma has appeared in the crossover role-playing game Heroes Fantasia. The series has been popular in Japan. Anihabara! listed s-CRY-ed in its top three anime series twice during 2001. In 2002, it took the same place in a poll by Animage. In the Animage's Anime Grand Prix awards, s-CRY-ed took the third place in the series category. The Kazuma character also took second place, being defeated by Inuyasha's title character. In a TV Asahi survey of the top hundred shows Japanese fans enjoyed, s-CRY-ed took 51st place. In March 2010, Kazuma was ranked nineteenth best male anime character of the 2000s by the Japanese magazine Newtype. The anime series has received mostly positive reviews by manga and anime publications. DVD Verdict's Mac McEntire said that while the first volume lacked depth, its action scenes made the series as well as its characters appealing despite their tendency to shout their attacks. In a review of the same volume, John Sinnott of DVD Talk also said the fight scenes were good, remarking it has more "plot" in contrast to other fighting series. He also found the two protagonists, Kazuma and Ryuho, appealing noting they have multiple similarities that had yet to be explored. Regarding the series' dialog, he expressed a preference for the Japanese cast over the English one. Seb Reid of UK Anime Network enjoyed the anime series but unlike Sinnot he felt the English dub was more "enjoyable". He also found the series' beginning enjoyable noting that while the series might be simplistic, he like the theme of "freedom", mostly seen through Kazuma's personality. While agreeing with Reid about the plot (to the point of comparing Kazuma to Han Solo from the Star Wars franchise due to their anti-heroic traits), Anime News Network's Zac Bertschy disliked the English dub. He also found the main plot confusing. Reviewers also compared the series positively with the famous Clamp series X. Bryan Morton of Mania Beyond Entertainment found the morality of some characters, such as Ryuho, who has several reasons for his cold personality such as his quest for revenge, interesting. Despite some issues with the animation, and not being a fan of fights himself, he recommended the series for fans of Dragon Ball Z, a series famous for its fight scenes. In a later review, Morton noted that Kazuma's character had developed as he not only fights Ryuho, but protect people from the Lost Ground. Despite saying he disliked the series for its focus on fighting, Morton noted s-CRY-ed "has grown on me a bit". Danielle D'Ornellas of Animefringe noted how many characters the anime covered, including both the protagonists and the antagonists, forcing viewers to pick which side they should root for. While she was not amazed by the animation, saying "strictly from an animation perspective, s-CRY-ed is average". She also found the English cast enjoyable while the music reminded her of a popular anime, Cowboy Bebop. The series' plot development surprised some reviewers. Reid was amazed by how the plot changed until its ending to the point of calling it an "excellent end to a superior series" despite having been able to predict most of the plot twists in the series. Justin Rich of Mania noted how similar both Kazuma and Ryuho became across the series with the exception of their upbringings and commented they still keep clashing every time they meet. Both Rich and Norton of Mania shared mixed feelings regarding the finale finding Kyouji Mujo's fight to be anti-climatic. As well, while the former liked the conclusion, the latter found it disappointing. Nevertheless, both of them found the final fight between Kazuma and Ryuho highly appealing. Don Houston of DVD Talk enjoyed how the relationship between Kazuma and Ryuho developed similar to "buddy films". While still clashing, they came to develop a mutual respect. He also recommended fans buy the DVD box rather than single volumes because of their high prices. In his review of the final volume, Houston stated that while the series started as "generic" its development allowed him to enjoy more of the show. He felt the storyline could have been finished in less than twenty-six episodes. s-CRY-ed was featured in an IGN article by Ryan Clements titled "The Anime We'd Love to Play". Clements commented that while the anime suffered from pacing and animation issues, both the cast and the powers were entertaining, remarking on the rivalry between Kazuma and Ryuho. In the 2007 book Manga: The Complete Guide author Jason Thompson found the manga "over-the-top" as an adaptation of the anime series. Thompson found it similar to Jojo's Bizarre Adventure based on the "enjoyably weird, exaggerated" art which is also one of the series' main appeal. ^ a b c Brown, Urian; Macias, Patrick (July 2003). "s.CRY.ed Animerica Interview Goro Taniguchi". Animerica. Viz Media. ISSN 1067-0831. ^ スクライド 1 DVD (in Japanese). Amazon.co.jp. Retrieved December 17, 2016. ^ "スクライド 9 DVD". Amazon.co.jp. Retrieved December 17, 2016. ^ スクライド 5.1ch DVD-BOX (期間限定生産) (in Japanese). Amazon.co.jp. Retrieved December 17, 2016. ^ スクライド Blu-ray BOX (in Japanese). Amazon.co.jp. Retrieved December 17, 2016. ^ "Japan's Animation Blu-ray Disc Ranking: October 24–30". Anime News Network. November 1, 2011. Retrieved December 18, 2016. ^ "Bandai Publicizes New Anime at Toy Fair". Anime News Network. Retrieved December 17, 2016. ^ "S-Cry-Ed - The Lost Ground (Vol. 1)". Amazon.com. Retrieved December 17, 2016. ^ "S-Cry-Ed - Final Fight (Vol. 6)". Amazon.com. Retrieved December 17, 2016. ^ "S-Cry-Ed - The Complete Collection". Amazon.com. Retrieved January 2, 2017. ^ "New UMD Releases". Anime News Network. July 17, 2005. Retrieved January 7, 2017. ^ "S-Cry-Ed (Vol. 1)". Amazon.co.uk. Retrieved December 30, 2016. ^ "S-Cry-Ed (Vol. 6)". Amazon.co.uk. Retrieved December 30, 2016. ^ "Upcoming Adult Swim Anime". Anime News Network. Retrieved January 3, 2017. ^ "S-Cry-Ed, Vol. 1". Amazon.com. Retrieved January 2, 2016. ^ "S-Cry-Ed, Vol. 3". Amazon.com. Retrieved January 2, 2016. ^ "S-Cry-ed - Anime Legends Complete Collection". Amazon.com. Retrieved December 18, 2016. ^ "Sentai Filmworks Adds Sacred Seven, The Big O, Kurokami, More". Anime News Network. August 10, 2013. Retrieved August 11, 2013. ^ "Scryed". Madman Entertainment. Retrieved December 30, 2016. ^ "Scryed CDs to go on Sale this Winter". Anime News Network. November 24, 2001. Retrieved December 6, 2016. ^ "Reckless Fire" (in Japanese). Amazon.co.jp. Retrieved December 22, 2016. ^ "Drastic My Soul" (in Japanese). Amazon.co.jp. Retrieved December 22, 2016. ^ "Scryed Alteration's Remastering to Add New Footage". Anime News Network. April 8, 2011. Retrieved December 28, 2016. ^ "Japanese Box Office, November 19–20". Anime News Network. Retrieved December 20, 2016. ^ "Japanese Box Office, November 26–27". Anime News Network. Retrieved December 20, 2016. ^ スクライド オルタレイション TAO (初回限定版) Blu-ray (in Japanese). Amazon.co.jp. Retrieved December 19, 2016. ^ "Japan's Animation Blu-ray Disc Ranking: February 20–26". Anime News Network. Retrieved December 20, 2016. ^ "Japan's Animation Blu-ray Disc Ranking: February 27-March 4". Anime News Network. Retrieved December 20, 2016. ^ "Scryed Alteration II Quan Slated for March 10". Anime News Network. Retrieved December 20, 2016. ^ スクライド オルタレイション QUAN (初回限定版) Blu-ray (in Japanese). Amazon.co.jp. Retrieved December 19, 2016. ^ "Japanese Animation Blu-ray Disc Ranking, July 23–29". Anime News Network. Retrieved December 20, 2016. ^ "Reckless fire 2011/SPIRITS" (in Japanese). Amazon.co.jp. Retrieved December 19, 2016. ^ "s-CRY-ed Alteration (Scryed Alteration) Sound Edition 2012". CDJapan. Retrieved December 19, 2016. ^ "Tokyopop Announces New Manga Titles". Anime News Network. October 25, 2002. Retrieved December 18, 2016. ^ "Scryed, Book 1". Amazon.com. Retrieved December 19, 2016. ^ "Scryed, Book 5". Amazon.com. Retrieved December 19, 2016. ^ スクライド 新しき盟約"ニューオーダー (in Japanese). Amazon.com. Retrieved December 23, 2016. ^ Luster, Joseph (March 8, 2011). "Anime Worlds Collide in Crossover RPG Heroes Fantasia". Otaku USA. Archived from the original on December 18, 2013. Retrieved December 31, 2016. ^ "Top Anime in Japan". Anime News Network. October 29, 2001. Retrieved December 3, 2016. ^ "Top Anime in Japan". Anime News Network. December 17, 2001. Retrieved December 3, 2016. ^ "June Animage Ranks Anime". Anime News Network. May 10, 2002. Retrieved December 3, 2016. ^ "Japan's Favorite TV Anime". Anime News Network. Retrieved December 4, 2016. ^ "Newtype's Top 30 Male and Female Characters of Each Decade". Newtype (in Japanese). Kadokawa Shoten. March 2010. ^ McEntire, Mac. "s-CRY-ed: The Lost Ground, Volume 1 (Anime Legends Edition)". DVD Verdict. Retrieved December 16, 2016. ^ Sinnott, John (September 27, 2005). "S Cry Ed Vol 1 Special Edition". DVD Talk. Retrieved December 16, 2016. ^ Reid, Seb (July 4, 2005). "ANIME REVIEW: S-CRY-ed Vol. 1". UK Anime Network. Retrieved December 2, 2016. ^ Bertschy, Zac (July 14, 2003). "Scryed DVD 1: Lost Ground". Anime News Network. Retrieved December 2, 2016. ^ Morton, Bryan (July 1, 2005). "s-Cry-ed Vol. #1". Mania Beyond Entertainment. Archived from the original on September 26, 2009. Retrieved December 2, 2016. ^ Morton, Bryan (September 14, 2005). "s-Cry-ed Vol. #2". Mania Beyond Entertainment. Archived from the original on May 24, 2009. Retrieved December 2, 2016. ^ D'Ornellas, Danielle (August 2003). "s-CRY-ed Vol.1: The Lost Ground". Anime Fringe. Retrieved December 2, 2016. ^ Reid, Seb (February 28, 2005). "ANIME REVIEW: S-CRY-ed Vol. 6". UK Anime Network. Retrieved December 2, 2016. ^ Rich, Justin (July 28, 2005). "s-Cry-ed Vol. #5". Mania Beyond Entertainment. Archived from the original on May 24, 2009. Retrieved December 2, 2016. ^ Rich, Justin (February 17, 2006). "s-Cry-ed Vol. #6". Mania Beyond Entertainment. Archived from the original on December 2, 2008. Retrieved December 2, 2016. ^ Morton, Bryan (April 3, 2006). "s-Cry-ed Vol. #6". Mania Beyond Entertainment. Archived from the original on February 1, 2009. Retrieved December 2, 2016. ^ Houston, Don (March 16, 2004). "S-Cry-Ed - Evacuation v5". DVD Talk. Retrieved December 15, 2016. ^ Houston, Don (May 25, 2004). "S-Cry-Ed: Final Fight V6". DVD Talk. Retrieved December 15, 2016. ^ Clements, Ryan (December 2, 2012). "The Anime We'd Love To Play". IGN. Retrieved December 2, 2016. ^ Thompson, Jason (2007). Manga: The Complete Guide. Del Rey. ISBN 978-0-345-48590-8. This page was last edited on 26 December 2018, at 03:47 (UTC).